A gambling company (CrownBet) and a brewer (XXXX Gold) are hooked to the latest campaign by the government’s Tourism NT, seeking to lure fishing enthusiasts to the Territory. Or rather to the Top End – because it’s about catching a tagged barramundi and winning $1m. As the competition is not restricted to tourists, some interesting questions are begging: the period when that fish needs to be caught to win the big money is October 1 this year to February 29, 2016. Amateur Fishermen’s Association of the NT Executive Officer, Tristan Sloan, says there are 32,000 amateur fishermen in the Top End. Times that by 50 weekend days and public holidays in that period, and you get 1.6 million fisherman / days. The Chief Minister’s office says the Top End gets 44,000 tourists a year who come for the fishing. Disregarding that many fewer would come in the wet season than in the dry, that would make it 18,300 during the five months competition period. As these visitors stay between two and 10 days, which would make an average of six, we get 110,000 fisherman / days. On that calculation a local is 15 times more likely to catch the prize fish and get the million dollars than a visitor. So is this all about tourism or an election? Chief Minister Adam Giles touts the Million Dollar Fish competition as generating “invaluable national and international exposure [putting] the Northern Territory on the global map as the place to come to fish. A spokeswoman says the aim of the barra campaign is to increase the number of visiting fishers by 10%. There will also be 75 tagged barramundis worth $10,000 each, resulting in a possible total prize money of $1.75m (limited by how many barras the sharks or crocks munch). 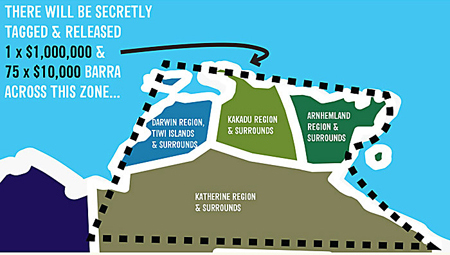 The good news – including for the people of Braitling, the electorate of Mr Giles and more than 1200 km distant from the fishing grounds (above, left) – is that the government is putting up only $250,000, plus what it costs Tourism NT to run the campaign. 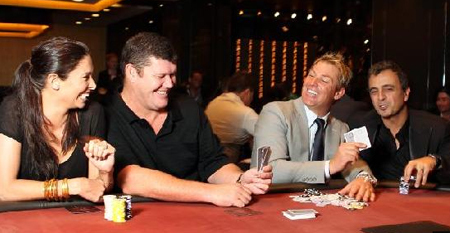 Most of the rest comes from CrownBet owned by James Packer (pictured 2nd from left, with friends in a publicity photo). Other partners in the barramundi campaign are Boating Camping Fishing (BCF), AOT Travel Services and Qantas. Apparently, rumour has it they are about to announce a similarly themed effort to lure people to the Barkly. They are going to release 80 specially tagged empty green cans into the wilds around the region, with 75 of them winning the lucky finders a $5000 tab at a bar of their choice (paid on corporate credit card, of course). Four of them win the finder and a mate a return trip for a week in New York, all expenses paid with a seat at the front of the plane and a cot at the best pub in town. The grand prize is your own charter flight to Vietnam so you can take a selfie with a cardboard cut-out of Tony Abbott. No-winning entries get you 10 cents each.